The next book to feature from our book swap is, in fact, two books! From Hilke, known on Etsy as Buechertiger. 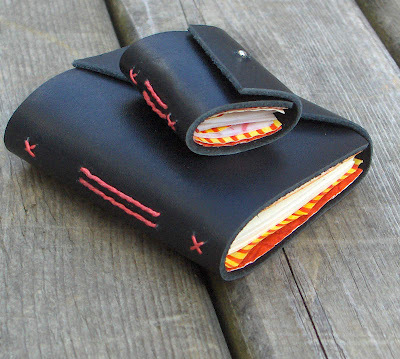 These two small leather books are made with similar materials. Hilke has used two different closures: one is magnetic and the other closure is made from the bottom part of a snap. The binding is done with both a primary and a secondary sewing. 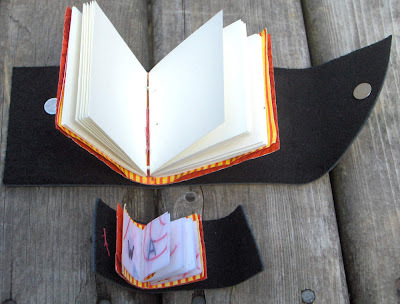 The inside pages are wrapped with striped paste paper and some red "leather" paper. Visit Buechertiger.Etsy.com for more of Hilke's books. The bigger of the two books (which is still pretty small) is blank and the tiny book contains an anagram. Though of course they can be used as desired the notebook was meant to hold some of the anagrams you found yourself after the 'inspiring read' ;-) of the smaller one. I like this idea of a double cover..gives you more leeway to play with the inside cover using more "fragile" materials or media..like watercolor. Lovely little set! I like how the half snap was used on the teenie one as a closure.